Safe & Sound Vehicle Systems offer a great range of insurance and Thatcham Approved Trackers suitable for fitting to all Porsche models. We offer Porsche Trackers fitted in Leeds from some of the industries leading manufacturers including Trackstar, Smartrack and Vodafone Automotive. Porsche as a manufacturer prefer to see the Vodafone brand of tracking system installed to their vehicles however all our devices are equally as good as each other making it a tough choice but rest assured any one of them, once installed to your Porsche vehicle significantly increase your chances of recovering your vehicle after theft. Our fully mobile installation engineers are available to install your Porsche Tracker to your vehicle throughout Leeds and surrounding areas. This could be at your place of work or your home address at a time to suit you. 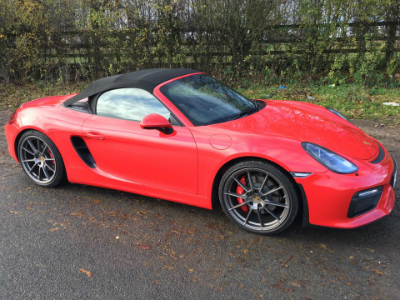 This particular image shows a Porsche Boxster Spyder in Leeds fitted with a Vodafone Protect and Connect 5 installed, giving remote engine immobilisation and driver recognition throughout Europe. Insurance companies often stipulate the fitting of a Thatcham Category 5 or 6 tracking device as a condition of cover for theft on you policy. For your convenience we have listed some of our most popular Porsche Trackers below, all of which are available for fitting in Leeds. These are suitable for all ages of Porsche and all Porsche models. Should you require any help in choosing your Porsche Tracker the please feel free to contact us where we will do our best to help you.